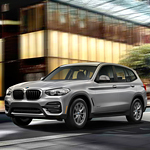 Have you seen the new BMW X3? US News & World Report rated it as one of the top SUVs in the luxury compact class with high marks in performance, interior, safety, and reliability. You can go far on this vehicle’s fuel efficiency at the base trim, which gets 30 mpg on the highway with 245 horsepower. Want more performance? BMW introduced a whole new trim this year called the sDrive30i. This new model features a rear-wheel drive configuration that lets you get the most performance from your SUV. Drivers state that the X3 has more seating and cargo room than previous models, and it outdoes many of its competitors in the same class. You can seat 5 comfortably in the X3, and there are plenty of safety features to help you stay in control while driving. Having issues with lane departure? The new lane departure assist can help keep you in line. Get back in the driver’s seat and take control of your experience with the latest BMW X3. Try it today at Flynn BMW.